In 1980, a four young men hailing from the British town of Basildon decided to start a band. 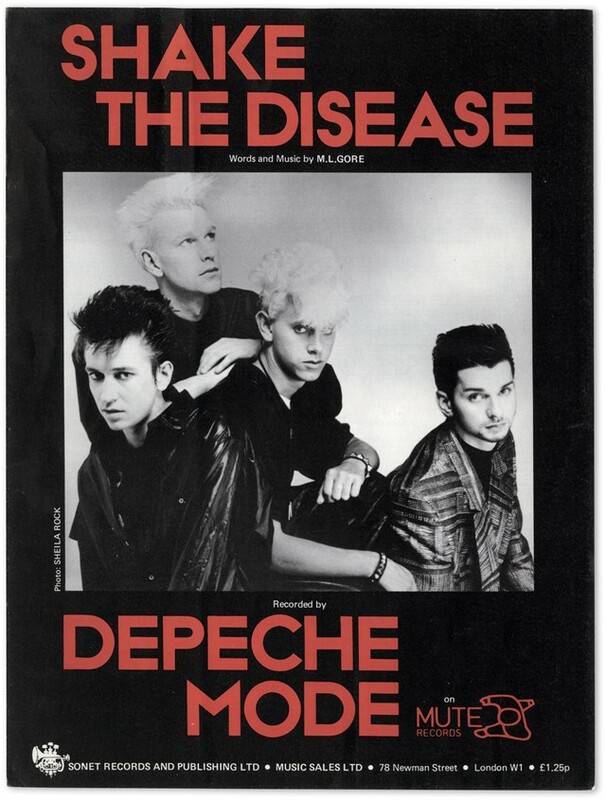 They named it ‘Composition of Sound’, a very formal way of describing one of the defining factors of their 37-year career, and quickly adopted, ‘Depeche Mode’ (translation: ‘Fashion News’) after spotting it on the cover of a French magazine. Their music, like their name, was cutting edge. Coming into their own just as synthesiser music was making waves, Depeche Mode received offers from major labels but decided to sign with Mute Records, a London-based independent that was emerging as the sound of the times. Daniel Miller, the label’s founder, started Mute in 1978 to release his own one-man electro-punk project The Normal, and the label subsequently signed a roster of artists that approached synth music with a DIY punk attitude. By the mid-80s, Depeche Mode had become an international phenomenon, and one of the places their music made the most impact was with the youth living inside the Eastern bloc. Although their records had been banned by official channels, some Western radio and TV still reached fans, and Depeche Mode became musical heroes for a new generation. As a teenager growing up in East Germany, Dennis Burmeister was slowly becoming the band’s number one fan, after having a lightbulb moment listening to “Pipeline” on the radio around 1983 or 84, then seeing a video for “A Question of Time” in 86. He began amassing a collection that would grow to more than 10,000 pieces – the most extensive archive of Depeche Mode memorabilia in the world. Burmeister got started by swapping tapes with friends before he was finally able to buy hard copies after the Berlin Wall came down in 1989. Over the years, his role began to grow as he recognised the importance of being not only a collector but a historian. By the early 00s, he had become a consummate insider, working as webmaster of the Toast Hawaii label, founded by Depeche Mode member Andy Fletcher. In 2008, Burmerister met Sacha Lewis, a fellow Depeche Mode historian who was working on a documentary film. They quickly hit it off and saw the perfect opportunity to pool their talents and resources into creating a book, Depeche Mode: Monument. Featuring more than one thousand objects from Burmeister’s archive, Monument is a detailed chronology of the band who – after 100 million album sales – still show no sign of stopping. Burmeister and Lewis told us what it takes to build a monument to the band. What was it like growing up in East Germany during the 1980s? Sascha Lange: As a teenager, the narrowness of the dictatorship was only felt gradually. Both the youth in East and West Germany were interested in the same things: pop culture, music magazines, records, and clothing. The big difference was that in the East, we struggled to get these things, so we had to improvise, self-create, and organise many things ourselves. Did the government care about music or try to interfere in any way? Sascha Lange: The state always tried to keep everything under control, including what sort of Western pop music was introduced here. However, this was undermined by the West German radio stations, so there were already some unwanted freedoms in East Germany (GDR). The GDR department of culture always tried to establish their own culture. Among them there were some really good musicians in the 1970s, but they barely reached the youth in the 1980s. The Western bands were just cooler. In 1986, the youth radio (station) DT64 was established in East Germany and became immediately popular among the youth as they ticked the right boxes. What was it about Depeche Mode that captured your attention? How did they stand apart from other bands at the time? Dennis Burmeister: The most noticeable thing about Depeche Mode was the strange sounds coming from computers that you never heard before. Some people did not understand the challenges of the creative process, but in retrospect you have to recognize ‘sampling’ as a complex art form. Sampling was pretty new at the time and electronic music was (considered by many to be) basically inferior. I remember plenty of discussions with my dad who was a Rolling Stones fan and refused to call Depeche Mode’s songs ‘music.’ Absurd – but that was actually a common opinion back then. Also, the incredible videos and the visuals of Anton Corbijn made Depeche Mode stand out. Without his influence, the band might not have the status they have today. What qualities of Depeche Mode turned you into a fan? Sascha Lange: The singles, released back in 1984. Depeche Mode offered great new music and a distinctive outfit. The band seemed like a gang and you want to be a part of that gang. They were different in style and sounds from all the other mainstream bands – more indie. Dennis Burmeister: Collecting is nothing you decide to do. It’s a process and takes time. You won’t be a fan overnight, just because you bought a compilation of records. After the Berlin Wall came down in 1989, my first Depeche Mode track was the single CD of ‘See You’. I listened to it at night in endless loop on headphones. It was an almost Biblical event. The crystal-clear sounds, the creaking and beeping – we in East Germany were not too familiar with this. We had (been listening to) dodgy, noisy tapes and radio recordings where you could hear radio interference. How did you build your collection? Dennis Burmeister: There was no system. I just took everything I could get. I was interested in press sheets early on. There were times when I paid a few pennies for these leaflets. Today, they sometimes go for three-digit figures from hand to hand. Crazy, isn’t it? I have a rather extensive collection with many different items, that illustrate the history of the band quite well. I was often portrayed in the press as a super fan or super collector. But certainly there are many fans like me. I don’t see myself in that role. What inspired you to become an historian and what are your primary goals? Sascha Lange: I became a historian because I have always been interested in history and especially in the youth cultures in the 20th century. I was particularly impressed by oppositional youth cliques during the National Socialist era, such as the Edelweiss Pirates or the Swing Youth. A historian should always try to consider all sides, to evaluate all sources, and to share his insights with the world. A collector collects mostly for himself, whereas a historian should explain other things or let the people participate in his new findings. Please talk about how you met in 2008 – when did you realize that a book would be the natural outgrowth of your combined talents? Sascha Lange: In 2008, Dennis and I met by chance when Anne Haffmans – then the Mute Records manager for Germany – introduced us at the label office in Berlin. She knew both Dennis and his incredibly large collection, as well as my first work on youth in the GDR. We both grew up in the GDR during the 80s as Depeche Mode fans and began talking about the possibilities to make a big book about the band. The concept was quickly realized. In 2012, Blumenbar–Aufbau-Verlag in Berlin agreed to do the book and we got down to work on it. Depeche Mode stands apart from so many bands of the era, not just for their longevity, but for the music itself. What are some of the most significant contributions the band has made over the years? Sascha Lange: The most impressive thing about Depeche Mode is still the gang mentality as a band – and they are still original. I do not know any other band that sounds like Depeche Mode. There are some smaller bands trying, but they are still struggling to get anywhere close to the original. Until a few years ago, Depeche Mode were with Mute Records, an indie label. This shows clearly that you do not necessarily have to be with a major label to become world stars. For young people in East Germany and Eastern Europe in the 1980s, the music of Depeche Mode was also a spiritual escape from everyday life in a dictatorship. This fan love continues today and it shows once again that Depeche Mode is much more than just three musicians who release a new record every four years. For all the young collectors out there who are following bands or other artists, what advice do you have for them to create a ‘Monument’ of their own? Dennis Burmeister: Your collection will never be complete – mine isn’t.